The Imperial Household Ministry’s Construction Bureau, which oversaw the planning and management of all buildings, gardens and civil engineering projects under the jurisdiction of the Imperial Household Ministry, also oversaw the construction of the Prince Asaka Residence. At the time, the bureau’s engineering department was headed by K¯oz¯o Kitamura (1877–1937) and was divided into separate offices of architecture, civil engineering, mechanical engineering, and gardens. More than 100 people were on staff, including the engineers and the expert technicians in each office. The architect Y¯okichi Gond¯o (1895–1970), who had returned from a study tour of Europe and America, was in charge of the basic design. Other specialists contributed their talents, among them, Takashi Oga, who designed the radiator covers and mosaics, and Masao Mizutani, who was in charge of the light fixtures and the furniture. 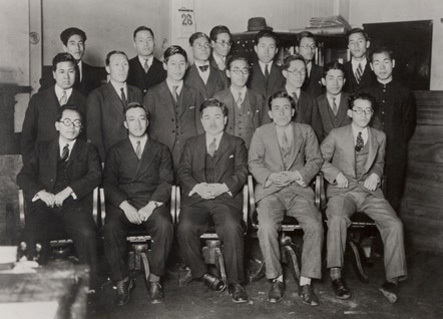 These men were also involved in the construction of other imperial-family residences, including those of Prince Chichibu (built in 1927); the Korean crown prince Yi Un (built in 1929), and Prince Takamatsu (built in 1931). The Construction Bureau also supervised the construction of the main building [honkan] of the Tokyo National Museum. Work on that building, which was in progress at the same time as the Prince Asaka Residence, was completed in 1937 according to a design by Jin Watanabe. The basis for the design for the Prince Asaka Residence was another imperial-family home designed earlier by the Construction Bureau, a residence for Prince Higashifumi that was completed in 1925. Similarities include the inclusion of both living quarters and offices and utilizing a basic square as the configuration for the building. Rapin was a painter and interior designer, born in Paris. He studied under the Neo-classical artist Jean- Léon Gérôme at the École des Beaux-Arts, and from 1898 exhibited his paintings at the Salon of the Académie des Beaux-Arts. Around 1900, he began to submit furniture and decorative objects to the Salon, and gradually his gift for design came to be recognized in the world of decorative art. Rapin’s style, distinguished by delicate craftsmanship, luxurious materials, and rich colors, attracted attention in a wide range of fields, including architecture, interior decoration, furniture, murals, stained glass, and ceramics. In 1920, Rapin became aesthetic adviser to the Sèvres National Porcelain Manufactory, as well as deputy chairman of the Association of Decorative Artists. He was in charge of the planning and design of a number of pavilions in the Art Deco Exposition of 1925, including those of the French Embassy and the Sèvres National Porcelain Manufactory. 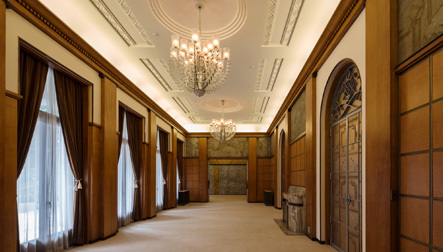 Rapin created the interior design for seven rooms at Prince Asaka’s Residence: the great hall, the salon, the small drawing room, the anteroom, the great dining hall and the prince’s study and sitting room. While he himself created the wall paintings and designed the furniture and the decorative fountain (the “Kosui-t¯o,”or Perfume Tower), he also brought in fellow artists to help with the project. By successfully incorporating their work into the whole, Rapin created a harmonious Art Deco space. Lalique was a jewelry designer and glassmaker, born in the village of Ay, in Marne, Champagne, France. Concerned more with artistic form than the intrinsic value of the materials, Lalique used semiprecious stone, glass, horn, etc. in innovative ways to fashion jewelry with motifs of plants, insects, nudes and other figures. He was a leader in establishing Art Nouveau design in jewelry, and his work in this area won high praise at the Exposition Universelle in Paris in 1900. In 1906, he was commissioned by the perfumer François Coty to design perfume bottles, and this launched his career as a glassmaker. Using pressed glass- and blown glass-working techniques, suitable for both artistic expression and mechanized production, he made diverse works ranging from small objects, such as the hood ornaments for automobiles, to monumental pieces for architectural use. One of his large-scale works was the glass tower fountain (“Les Sources de France”), created for placement in the center of the exhibition grounds of the 1925 Art Deco Expo. Lalique had his own pavilion nearby, evidence of his unequivocal achievements as a master craftsman of glass. For the Prince Asaka Residence, he designed the glass-relief doors in the front entrance hall; he also created the chandeliers in the salon and the great dining hall, known as “Bucharest” and “Pineapple and Pomegranate,” respectively. Blanchot was a sculptor and painter, born in Bordeaux, France. Having set his sights on becoming an artist, Blanchot left university and studied sculpture at the École des Beaux-Arts de Bordeaux. Afterwards, he moved to Paris and, around 1893, became a member of Sociétaire des Artistea Française (the Association of French Artists) and began to exhibit his works in its salon. He enrolled in the sculpture department of the Sèvres National Porcelain Manufactory in 1930, and in 1933 was appointed as a lecturer in its affiliated art school. He tutored Princess Nobuko in watercolors when she and the Prince were staying in France, and was therefore invited to become involved in the rebuilding of their residence. 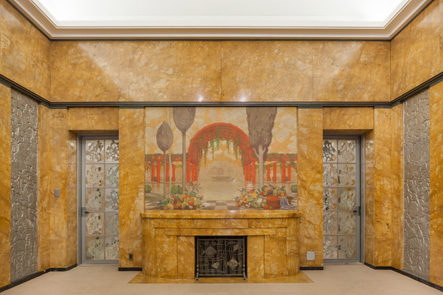 Two of Blanchot’s works can be seen at the Prince Asaka Residence today: the marble relief in the great hall, which is entitled “Children Playing,” and the floral relief gracing the wall of the great dining hall. His signature can be seen on both. Ingrand was a painter and glassmaker, born in Deux-Sèvres, France. 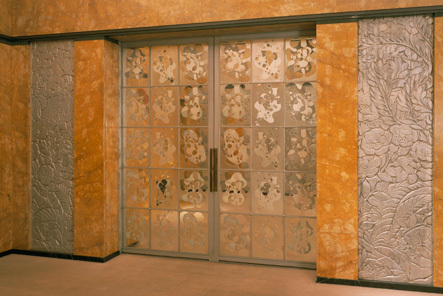 In the period between the two World Wars, Ingrand, together with his wife Paule, produced works in glass for a number of interior design projects, including the Le Normandie and other luxury ocean liners. His early works featured figural motifs taken from mythology and the natural world, but after World War II, he gradually turned to simpler, more modern forms. He became a representative French artist in the field of stained glass, designing windows for many churches, including St. Peter’s in Yvetot, Haute-Normandie (1956). 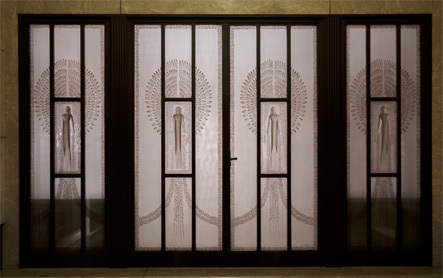 For the Prince Asaka Residence, Ingrand contributed the etched glass in the doors of the salon and the great dining hall. Subes was an ironworker, born in Paris. He studied at the École Boulle and the École Nationale des Arts Décoratifs. Beginning in 1911, he trained for three years with Emile Robert, and in 1919 became the director of the atelier Borderel et Robert. There was no limit to the variations he created using graceful, lively curves and geometrical patterns, and his work embellishes the interiors of many grand building and ocean liners, beginning with the SS Ile de France constructed in the Interwar period. He worked on both Rapin’s pavilion “Ambassade Française” and Ruhlmann’s “Hôtel du Collectionneur” for the Art Deco Expo of 1925. In 1937, he assured his reputation with his monumental façade for the “Pavillon du Métal” of the Exposition Internationale des Arts et Techniques dans la Vie Moderne [International Exposition dedicated to Art and Technology in Modern Life]. 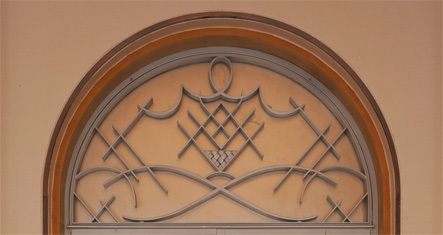 For the Prince Asaka Residence, he created the tympani (semicircular decorations) above the glass doors of the salon.